Sometimes the day after tomorrow isn’t soon enough. It may be a small point, but we know fast delivery is often a big issue for professionals in an industry that’s famous for tight deadlines. 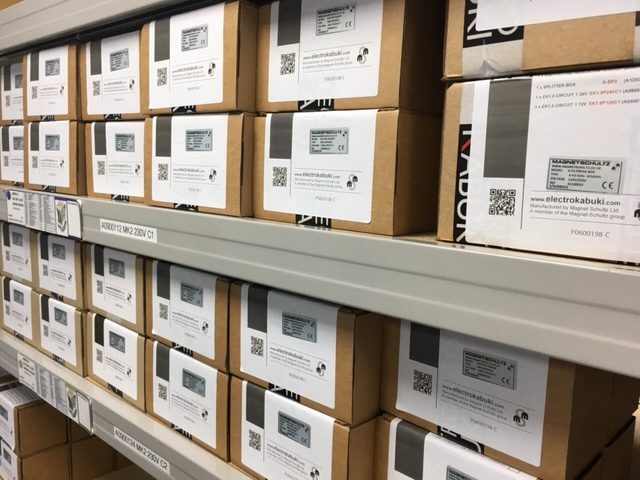 That’s why all Electro Kabuki components, parts, spares and systems are held in stock at our UK headquarters in Surrey, ready for immediate despatch worldwide. In addition, our distributors also hold stock of Electro Kabuki parts and spares. That gives you plenty of ‘just-in-time’ options should you ever need something in a hurry. Our first-hand experience of the events staging and rigging industry shows that urgent or last-minute requirements crop up all the time. So it’s reassuring to know that we can ship ex-stock immediately. Owners of Electro Kabuki systems sometimes don’t notice that a part has gone missing since it was last used. Or the job turns out to be bigger than envisaged once the rigging crew is at the venue, staring it in the face. Or an alternative drop effect mechanism specified by the set designer is simply not man enough for the job. These are but a few of the time-critical realities that have been shared with us. We designed and developed Electro Kabuki at our engineering centre in Old Woking, Surrey. We assemble and test all the dropper modules, firing boxes and cables in the same premises. And we keep an ample stock of every Electro Kabuki component in our warehouse – in the same premises – to make everything available ex-stock. If you ever have a last-minute requirement for an Electro Kabuki part, or an entire system, don’t hesitate to contact us. We’re set up to help.